A heart block is a type of arrhythmia. It is caused by a problem in the heart's electrical system, which controls the rate and rhythm of heart beats. A heart block may be congenital (present from birth) or acquired. There are three different degrees of heart block, which vary in terms of severity. The best way to identify any kind of heart block is using a ECG. 1. Understand what the term "heart block" refers to. The term heart block refers to an AV block or an atrio-ventricular block. This is when there is some obstacle blocking electrical signals between the upper and lower chambers of the heart. There are three degrees of AV block according to severity - first degree, second degree and third degree. Second degree heart blocks have two subtypes. 2. Recognize the symptoms of a heart block. First degree heart block usually does not produce any symptoms. Second and third degree heart blocks may also be asymptomatic. However, when the condition persists for a long time, heart failure may occur. Dizziness and fainting may occur due to a temporary interruption in the blood supply to the brain. In complete heart block, ventricles beat very slowly which may lead to heart failure. In this case, you may experience fatigue, coughing, shortness of breath, chest pain, leg swelling etc. These symptoms indicate serious illness and require prompt medical attention. 3.Identify a first degree heart block. A first degree heart block occurs when the electrical signals passing between the atria and the ventricles (the upper and lower chambers of the heart) become slower than normal. A first degree heart block can be identified on on an ECG by a longer, flatter line between the P and R waves. Causes of first degree heart block include drugs (such as beta blockers, calcium channel blockers, digoxin and amiodarone), heart attack (or myocardial infarction), age-related degeneration of conduction system, electrolyte imbalance (particularly potassium), increased parasympathetic activity etc. First degree heart blocks are usually asymptomatic and do not require treatment. 4. Know what causes a second degree heart block. A second degree heart block occurs when the electrical signals passing between the atria and the ventricles slow down significantly, and some of the signals never even reach the ventricles. When electrical signals do not reach the ventricles, the ventricles fail to contract. This prevents blood from being pumped around the body, to the lungs and other important organs. The are two subtypes of second degree heart blocks - Mobitz type I and Mobitz type II. 5. Recognize Mobitz type I. With a Mobitz type 1 heart block, the electrical signals moving from the atria to the ventricles become progressively slower with each heartbeat, until the heart eventually skips a beat. Mobitz type 1 is identified on an ECG as follows: As the electrical signals slow, a line appears between the P and QRS waves. This line is known as a PR interval. These lines get progressively longer until the heart skips a beat, at which point there is no QRS wave following the next P wave. The causes of a Mobitz type 1 block are the same as for a first degree block. Sufferers of a type 1 heart block may experience a little dizziness but they usually won't require treatment. This type of block is less severe than a Mobitz type 2 block. 6. Know how to identify a Mobitz type 2 block. In a Mobitz type 2 block some of the electrical signals passing from the atria to the ventricles are blocked, resulting in a skipped heart beat. Unlike with Mobitz type 1, the pattern of blocked electrical signals is unpredictable. Mobitz type 2 is identified on an ECG as follows: At first, the ECG will appear normal, as the QRS wave follows the P wave at regular intervals. However, once an electrical signal fails to pass into the ventricles, the QRS wave will disappear completely. Common causes of this type of heart block are heart attack, heart surgery and age-related degeneration of the conduction system. Mobitz type 2 is more serious than Mobitz type 1, and in some cases a temporary pacemaker will be required if the patient develops significant bradycardia (heart rate below 60 beats/min). 7.Understand what a third degree heart block involves. In a third degree heart block, all of the electrical signals passing between the atria and ventricles are blocked. When this happens, it is referred to as a complete heart block or a complete AV block. 1. Understand what an ECG does. An electrocardiogram (ECG or EKG) tests electrical activity within the heart. The results of the test are interpreted through line tracings on a piece of paper, which contain a series of spikes and dips known as waves. 2. Know how to prepare for an ECG. Certain medications can interfere with the results of an ECG, therefore it's important to tell your doctor in advance about any prescription or non-prescription medications you are currently taking. You doctor will let you know if you need to stop taking these medications before the ECG or not. 3. Learn what the ECG involves. When it's time for the ECG, you will be asked to lie on a bed or table. A number of small electrodes will then be attached to areas around your body, like your arms, legs and chest. 4. Understand that there are no risks involved in getting an ECG. An ECG is a completely safe procedure, and there are no prohibitive factors to getting one. 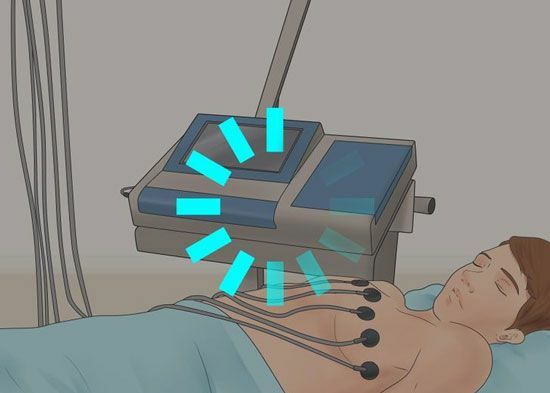 No electricity is passed between the electrodes and your body throughout the procedure, so you are not in danger of getting an electric shock. 5. Wait for the results. Following the ECG, your doctor will assess the results of the test by examining the pattern of spikes and dips on the paper, which represent the heart's electrical activity.